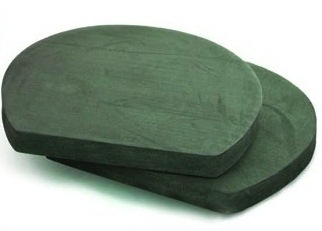 This is a Replacement pack of two HoofWrap EVA Foam Pads. An EVA foam pad is included with your initial Hoof Wrap purchase. Hoof Wraps can easily be removed, cleaned and reapplied. Use with a variety of hoof care poultice, topical solutions and medicated pads. Your horses will appreciate the custom fit, light weight and quick healing but most of all the freedom to go about their routine, even on turnout. You'll appreciate the durability and convenience of a one size fits most bandage system along with all the time you'll save by not having to make home-made bandages. Hoof Wraps is a multi-use, multi-purpose bandage for everyday horse hoof care and protection. Easily treat common hoof problems like horse hoof abscess, thrush and stone bruise, or use for protection after shoe loss. They're designed specifically for horses on turn out so your horse can still enjoy the freedom of mobility during treatment. The one size fits all system is designed to fit all standard size horses and the extreme grip fastening system ensures it stays on in the field regardless of the conditions! Four layers of 2200 denier ballistic nylon and industrial stitching offer tough construction. Trail riders - do you have back up hoof protection? Think of Hoof Wraps as your 4.7oz insurance policy. Machine wash. One size fits horse shoe sizes 00-0-1-2 or rough diameter of 4 to 5.5.